Dennis is figuring out the path to ecommerce success over at Store Growers. He translates what he’s learning from clients and his own projects into no fluff marketing advice that store owners use to grow their businesses. Growing a successful ecommerce business has never been easy. These days, considering the competition, it is harder than ever. Like any business, there are always hundreds of things to do, but only so much time and money to go around. And even if you have made solid plans to tackle all of these issues, emergencies will derail you. It isn’t easy to Find a balance between the things you should work on versus the things you actually end up working on. But amongst all of these to‐dos screaming for your attention, there are a few factors that matter a lot more than others. And if you get these things right, you get an unfair advantage over your competitors. So how do you know which factors are affecting ecommerce success the most? You can find the clues by looking at successful ecommerce businesses. These are traits that these businesses share. But they often aren’t visible on the surface, to find them you’ll need to dig a bit. Just because a successful ecommerce business has 1M Instagram followers, doesn’t mean that going after Instagram followers will get you those same results. So you need the root causes of success, not its by‐products to know where your time will be spent most efficiently. These are not groundbreaking findings, and you might easily glance over them. But they are really a lot more complicated than they seem on the surface. And if you want to make your store successful, you’ll need to know how to start working on these factors. And that’s exactly what we’ll be doing in this article. So let’s take a look at each one individually to see how you can improve in these areas. Getting boatloads of profitable customers for cheap is the holy grail for most ecommerce businesses. How low is low enough mainly depends on your preferred margin, lifetime value, and your competitors. The biggest part of this cost is the marketing expense to get a new customer. Even if you’re not actively spending money on things like advertising, each new customer still has a cost. At first, you can get away with simply spending your own time. But if your business is more established, you will likely hire experts or staff to do the marketing for you. This is the fuzziest but most impactful way to stand out and lower your acquisition cost. How many people have heard of your brand & know what it stands for? Why would a potential customer be triggered to check out your store? When I go through this exercise with my clients, we often come up empty. Deep down they can’t give a compelling reason why people should buy from them versus their competitors. That’s not because there is no reason, but because it’s well hidden. Going back to the origins of why the store came into existence will often help to find that reason. Make sure it is not just an artificial thing you made up because I just told you that you needed one for your brand. Take the following recipe that I often see: Take ANY product and donate product/money to charity when people buy. Businesses look at the success of the TOMS or Warby Parker and think it might work for them. I’m all for giving, but if it’s not part of your DNA, it’s just an add‐on. Visitors will see it, but it won’t be a reason for them to seek you out and buy suddenly. In this case, ask yourself how is the charity is supporting the core reason why you started the store? To see the ultimate example of how to create a brand from nothing but fake, check out this playbook to create your own minimalist watch brand. As mentioned above, brand building can seem pretty esoteric. But there are some effective ways to measure if you’re doing things right. Branded search traffic, and especially its trend over time, can function as a good indicator of increased brand awareness. Another reliable indicator is brand mentions. Every time your brand is mentioned, your reach expands. Certainly, not all mentions are equal, but consistent growth in this area will help to reach more potential customers. Below, I’ve plugged a brand into Ahrefs Content Explorer to see every piece of content where the brand was mentioned. For this type of analysis, I always like to sort by date to get the newest mentions first. If you want to be notified of brand mentions while they are happening, you can use the Alerts tool in Ahrefs. 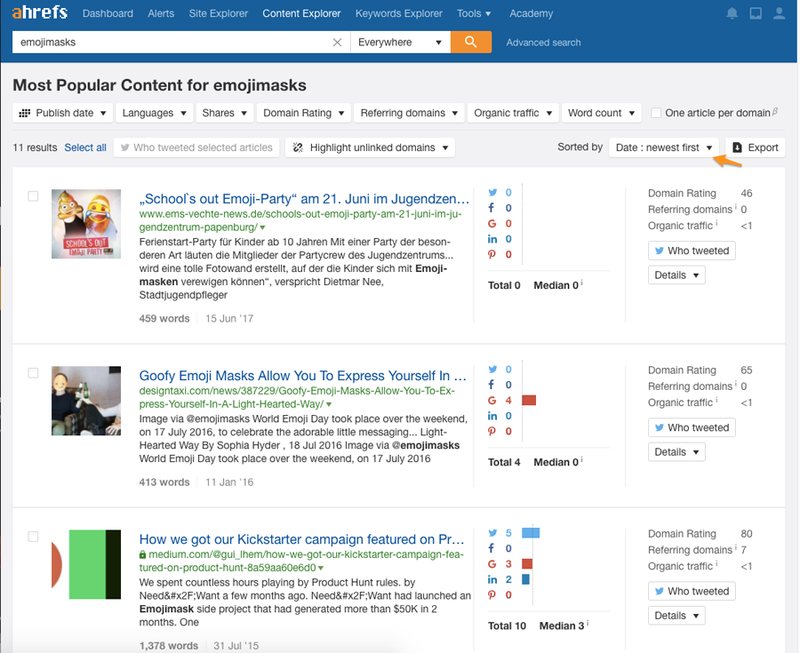 Just drop in the search queries you want to track into the Mentions tab. You can also do the same for some of your competitor brands to see how they are trending. Creating a strong brand means deciding what you stand for, and also what you don’t stand for. That means that you’ll have a better idea of who to target, and where to find these people. That’s a good starting point when it comes to marketing. So how do you stretch your budget as far as you can? You focus on marketing activities that are cheap: email & retargeting. But these are also low scale, meaning that the total volume of sales from these activities will be limited. If you stay away from what everyone else is doing, you’ll have a clear playing field. But the truth is that there are very little “overlooked” marketing channels your competitors don’t know about, and you can tap into. To me, the key is to take a new approach to an existing channel. Let’s go through a great example I saw recently. 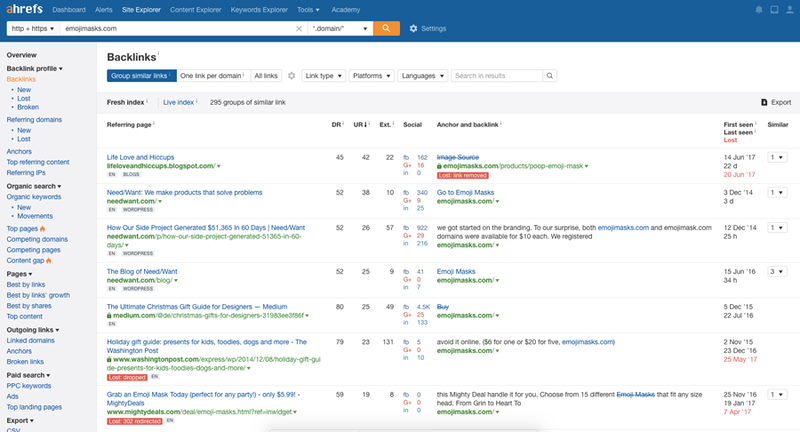 Most of the businesses trying to do ecommerce SEO are focusing very similar things: keyword research, content creation, outreach, link building, etc. That’s right, a $425 pair of jeans with fake mud. (They also have ones with fake paint if you were wondering). Over 1.2 k domains link to this page alone! These include links from sites like CNN, Fortune, and The Washington Post. You could try smearing mud onto your products, but since that’s been done now, you need a different approach. Instead of copying the tactics, try to replicate the principles. Those pants got the coverage because they appeal to curiosity (and even outrage) of the human mind. It’s clear that this worked and got them results, even if they sell exactly 0 pants. Check out these other creative approaches to a product bundle, Black Friday or profit. Just imagine how much smoother your outreach would be if you had something to pitch like these products compared to your current ones. But even if you come up with a great product, you’re not guaranteed a home run. To increase your odds of success, you can help to seed the initial coverage by reaching out to the relevant people. Instead of a spray and pray approach, analyze the backlinks that similar products got. If a blog or publication covered a product in an industry or niche similar to yours, there is a good chance they will be open for your pitch. From the screenshot above, it’s clear that the emojimasks were one of the favorite items among the Christmas gift guides. These type of clues can help you come up with a stronger plan when it comes to the exact format or timing of your pitch. Repeat orders are what the most successful stores are built on. 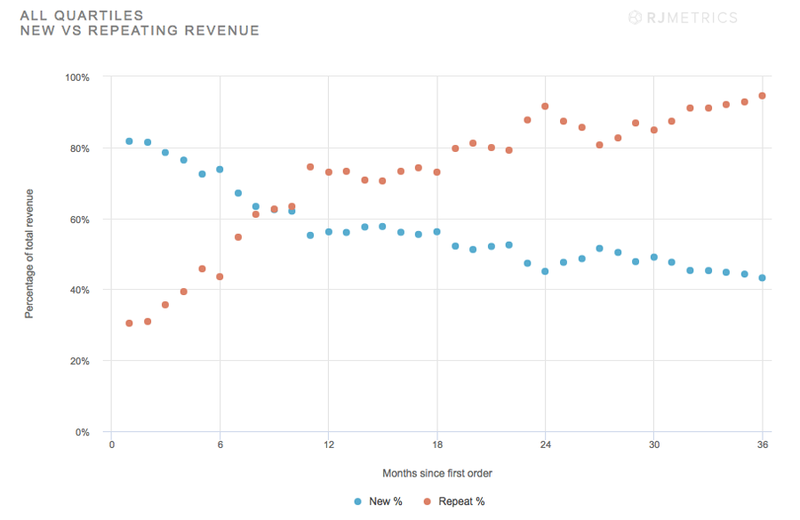 Research by RJmetrics revealed that the best ecommerce companies generate more than half of their total revenue from repeat customers after 20 months. And it starts contributing more to revenue than new customers afterwards. This factor increases the lifetime value for your ecommece customers, which is great for profits. Customer loyalty is something that’s the sum of a lot of important parts: customer experience, product selection, pricing, brand, and marketing. Notice how I’ve put marketing last. Because the most common approach to increase customer loyalty is simply get more in front of your existing buyers. Automated email campaigns can do exactly that. But if a customer had a poor experience when they first purchased, your campaigns will fall on deaf ears. Customer service should be at the top of your if you want to improve the customer experience. Making sure existing clients are happy is the bar. This will also generate more customer reviews. If you have a customer support person or team, make sure you also know what’s going on. How hard is it to find specific products? How enjoyable is it to browse through your product selection? How fast is the site? How easy can they find your “meta” information like shipping costs or contact details? You can get data points about these issues by looking at the site yourself. But the best is to have actual visitors give you feedback. Have a look at the tools like Hotjar or UserTesting to get this valuable input. If you’re a marketer, marketing is probably what comes natural to you. But really it’s the product that needs to come first. That might sound super obvious, but when I started my career, I’ve beaten myself up over the marketing results when the actual problems were with the product. It’s simple: to sell more, you need products that people. Getting your product selection right has an enormous impact on your conversion rates and on your repurchase rates. Picking and promoting the right products is a skillset which isn’t talked about, but it’s of vital importance. A healthy gross margin makes your ecommerce business easier to run. (As a benchmark, a MarketingSherpa survey found gross margins averaged between 22% and 38%). It gives your room to invest, offers more possibilities to acquire customers. This important factor is made up out of two numbers: revenue and cost. We’ve already looked at a piece of that cost: your marketing expenses. But of course, there are also other costs involved like product cost, shipping, and other expenses. Keeping costs low should be a priority for the business, especially early on. Even for Amazon being rationally cheap is part of their DNA. That’s why their desks where the old doors for the first couple of years. In the rest of the article, I’ll focus on increasing revenue, and more specifically, on how to increase the average order value. It might come as a surprise, but it’s not that much harder to sell a $2,000 coffee machine online vs a $19 anti‐age face cream. Even if your margin is lower, the total profit per order will be a lot higher on the first product. Experiment with different price ranges. Only got super cheap products? Try to add more expensive ones. Cross selling is selling complementary products like a $15 bottle of cleaning fluids for that $2,000 coffee machine. 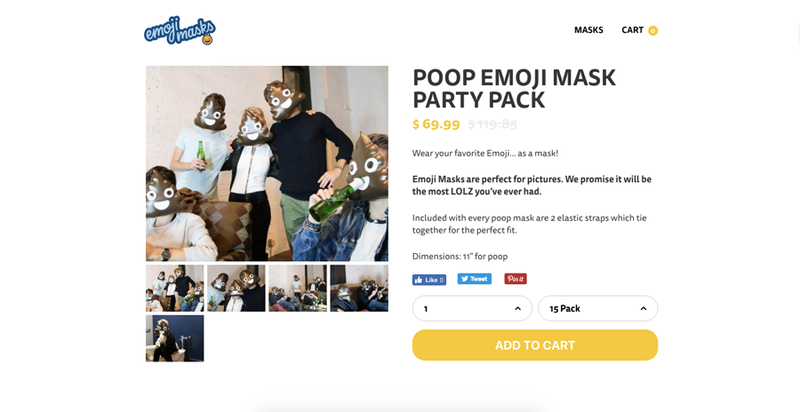 Or try bundling your cheaper products for a high price like these poop emoji masks. Normally, they will sell for $7.99 each. But the site thought that maybe people would want to buy 15 of them for a party. They sell that for $69.99, a price per unit to $4.6, a lot lower, but I’m sure these bigger orders are more profitable for them. While most people will buy, you can use psychological nudges to get people to spend just a little bit more. 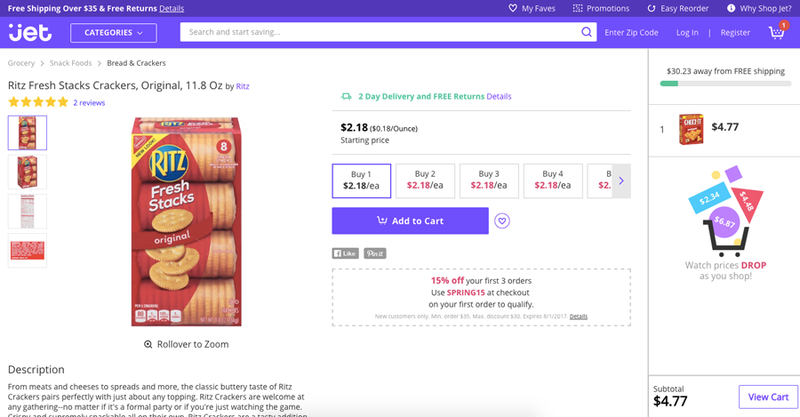 Jet.com has a feature that not only shows you how much you need to spend extra for free shipping, but it also displays discounts the more I add to my cart. You probably don’t have the bandwidth to explore on acquisition, retention, and profitability all at the same time. Your focus will depend on the stage of your ecommerce business development. If you’re just starting out, low cost customer acquisition strategies describe in this post will probably have the biggest impact. But then once you start getting a bigger number of visitors and sales, you can start working on customer retention. Then at scale, it’s time to dig into the cost and revenue and find out how to optimize each element in that equation.